Everlast Blacktop is a sought-after concrete contractor because of our 25-year history of being the best in concrete driveways and stamped concrete driveways. We provide accurate bids to our customers along with excellent service and quality concrete projects. Furthermore, you with find that Everlast Blacktop offers competitive rates as a concrete driveway contractor servicing the Barrington area. You can be sure that we will go the extra mile to make sure you’re satisfied with your concrete project. Everlast Blacktop is a concrete contractor that services both residential and commercial properties with concrete driveways or stamped concrete driveways. Barrington, Illinois is in both Cook and Lake County with a population of 10,327. Barrington is an affluent suburb of Illinois that lies approximately 32 miles northwest of Chicago and serves as a hub of activity for the surrounding areas. Many prefer the flexibility and look of stamped concrete driveways. Allow Everlast Blacktop to be the concrete driveway contractor that walks you through your project. Concrete driveways or stamped concrete driveways are more than just a surface to drive on, it’s an opportunity to enhance your property with a unique look. Everlast Blacktop is a concrete contractor who understands that every client has different specifications for projects, but they all want exceptional concrete driveways and stamped concrete driveways. This is exactly what Everlast Blacktop provides as a concrete driveway contractor. 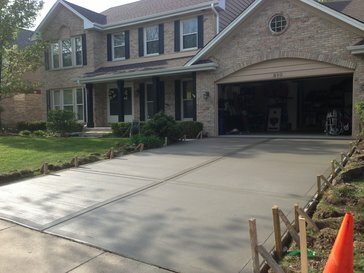 If you are in the Chicago Metropolitan Area and need a concrete contractor call (630) 855-5572!